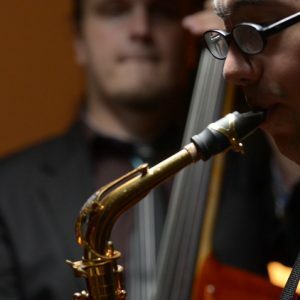 The Juan Arce Trio is a professional jazz trio that offers an elegant and groovy musical atmosphere for your event. They perform classic swing, blues, and bebop tunes, romantic ballads, latin (salsa, bossa nova, boleros) and pop songs among others, all interpreted with great passion and style by professional musicians with diverse backgrounds. Davidson, Sundar Visvanathan, Toby Stewart, and Cuban flautist/ saxophonist Carlos Amaran among others. Victor began classical piano studies at an early age, playing competitively in the Royal Conservatory of Music. He went on to study jazz music at York University, also focusing on composition. Utilizing a combination of vocal-imitative melody and contemporary left hand harmony in his improvised performance, Victor often strives for a diverse and eclectic sound. Currently Victor plays with various bands in Toronto ranging from R&B, Hip-Hop, Pop, and Jazz. Casey was born in Toronto but moved around with his parents a lot as a kid. He spent time in Australia, New Jersey, Brazil and the Netherlands before finally returning to Toronto for university. Casey’s background is in Blues music including guitar and harmonica, but he’s been pursuing Jazz bass at York University. Casey loves it here in Toronto and as well as digging the Jazz scene here, he loves being part of the city’s dynamic street culture scene.